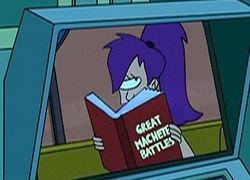 Great Machete Battles is a book Leela reads when Kif calls Amy on the video transmitter. Zapp then interrupts the transmission and zooms onto Leela, prompting Leela to throw the book at the screen. This page was last edited on 18 January 2012, at 10:33.